it is indeed Kipps apparatus, I guess the year is somewhat irrelevant. is it for lighting or audio? Actually, it is probably a P model, 1700 of these were built, only about 35-40 of the gray meanies were built. 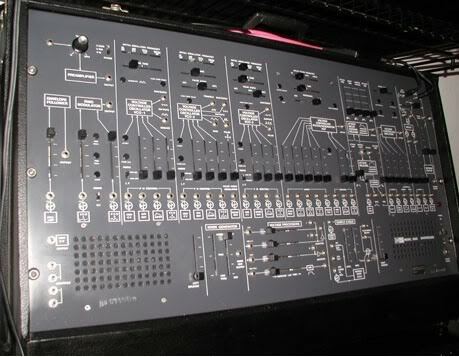 Nice Kit, I used to have an ARP Odessey, great sounds! I had an Odessey too. Had access to 2 2600's in the elec music lab at the college I went to. The electronic music class had 4 students. Way to go, Barb!!!!!!!!!! Wow, free tickets to a hockey game, a good chance at a near half/million dollar home, and now you correctly guessed a " DC picture"---what a rock-ON week you have had!!! Truthfully, I did see the first one you posted before you replaced it with this one. It had some identifying marks which I looked up, then found the Grey Meanie which looked like the above picture. Ok, away from electronics for at least one round. This one is probably way too easy. Who is this?